Yukon River is the third longest river in North America with a length of 3,190 kilometers. It is a major watercourse of north-western North America. The drainage basin of this river covers 832,700 square kilometers. Earlier, the upper course of this river was known as Lewes River. The source of this river is the Llewellyn Glacier at the southern end of Atlin Lake in British Columbia. Some major tributaries of the river are Big Salmon River, Stewart River, White River, Klondike River, Indian River, Beaver Creek, Bering Creek and Reindeer River. Yukon River was one of the main waterways during the Klondike Gold Rush through which people travelled. Teslin River, Pelly River, White River and Stewart River are four principal tributaries that feed this river. Starting in British Columbia this river ends in Alaska. Eventually, it empties into the Bering Sea. It is also home to Whitehorse Fishway which is the longest wooden fish ladder in the world. The Yukon River Quest is the longest annual canoe and kayak race in the world at 715 kilometers. Some large lakes that are part of this river system are Lake Laberge, Kusawa Lake and Kluane Lake. The name Yukon has been derived from the Gwich’in language that means Great River. The Yukon–Kuskokwim Delta is a river delta located where the Yukon and Kuskokwim rivers empty into the Bering Sea. The drainage basin of the river is the fourth largest in North America. Declan, Tobin. " 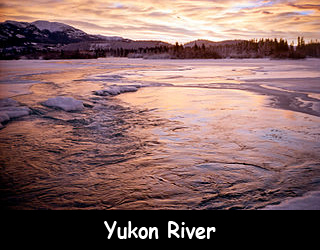 Fun Facts for Kids about Yukon River ." Easy Science for Kids, Apr 2019. Web. 23 Apr 2019. < https://easyscienceforkids.com/yukon-river/ >.